Windscribe is one of the highest recommended VPN options available that also offers an awesome free version that assists internet users in masking their physical location, block advertisers, circumvent censorship, block trackers and offers 100% private and secured daily use. With Windscribe even the service information is encouraging since signing up don’t even require an email address and data allowances is between 10GB for the free version up to 2GB. The Windscribe system records a timestamp of users last visit as well as total bandwidth used in a month, although there is no session log of any kind of history and absolutely no log whatsoever on outgoing or incoming IP addresses on any individual’s activities. As a VPN, Windscribe does need to keep a record of the current month session since it offers bandwidth-limited options, what is refreshing is that the VPN mentions this, while other service providers hide it amongst their vague clauses. What we like more is that Windscribe is open about the data they store in a temporary location. This includes the time of connection, OpenVPN username, VPN server connected to, and the amount of data transferred in the duration of the session. The data mentioned is discarded and expires within 3 minutes once the session is terminated, and that is what we love about Windscribe as all details are exceptionally clear. Windscribe entered the VPN service industry in 2016 and is owned by Windscribe Limited based in Toronto, Canada. The relatively new VPN service provider offers a free service that is already used by well over 630,000 individuals worldwide. 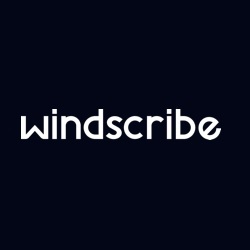 • Ease of use offered via minimalist clients that makes using Windscribe VPN across all platforms a breeze. • Large international network with servers placed in 100 cities across 55 countries. • No logs kept at all, of any internet activities or downloads. • A particularly strong AES-256 cipher with SGA52 auth and 4,096-bit RSA key encryption. • Windflix unblocks Netflix US from any destination. Windscribe offers both a free and several other well-priced subscription options, including its Monthly Plan, Biennial Plan and Yearly plan. 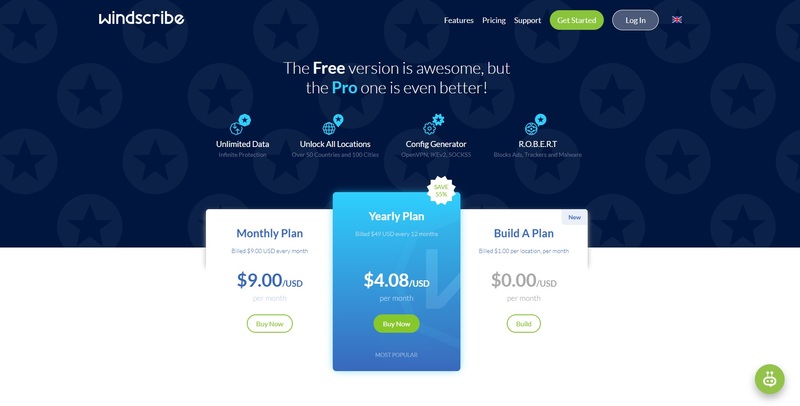 The major difference between the free and the Pro Windscribe VPN accounts are that Pro features unlimited data as well as access to servers based in more than 50 locations. After several independent tests for viruses or WebRTC and DNS leaks, Windscribe VPN came out clean, and all testing agencies gave Windscribe three cheers for reliability, exceptional services and robust security. Depending on where the user is situated, and the VPN connection is established to, the download and upload speeds can be influenced, speed tests showed, in general, an upload speed of 53.00 Mbps and a download speed of 98.71, although it is also important to remember that your internet speed could have a major effect on both speeds. Windscribe VPN offers all the best protocols including IKEv2, OpenVPN and SOCKS5, what massively impress security professionals is the encryption used by the VPN service provider of SHA512 auth and 4096-bit RSA key and for browser extensions AES_128_GCM. No Viruses and No leaks were detected via multiple tests which proofs that Windscribe VPN is not only the very best free but also the most reliable VPN option when it comes to safe to use VPNs. With Windflix it is easy to bypass all Netflix restrictions while Dashlane is a password manager. Windscribe VPN is the best protection users could enjoy on all platforms, and easy installation is guaranteed via apps for Windows, iOS, Android, Linux, Chrome, Firefox, Amazon TV as well as Torrents including qBittorrent, Deluge, VUZE and uTorrent.